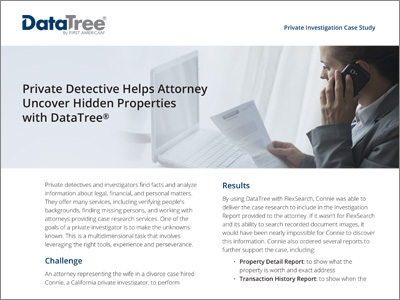 Private detectives and investigators find facts and analyze information about legal, financial, and personal matters. They offer many services, including verifying people's backgrounds, finding missing persons, and working with attorneys providing case research services. One of the goals of a private investigator is to make the unknowns known. This is a multidimensional task that involves leveraging the right tools, experience and perseverance.